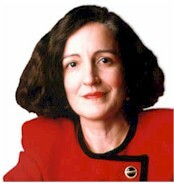 Gloria Tristani, a Democrat, is a Commissioner on the Federal Communications Commission. She was nominated by President Bill Clinton on September 15, 1997, confirmed by the Senate on October 28, 1997, and sworn in on November 3, 1997. She was born and raised in San Juan, Puerto Rico. She is the granddaughter of the late Senator Dennis Chavez, who represented New Mexico in the U.S. Senate from 1935 to 1962. She was a resident of New Mexico from 1982 until 1997. She is married to Gerard W. Thomson and has two children, Vanesa and Jorge. Undergraduate degree, Barnard College at Columbia University. Attorney in private practice in Albuquerque prior to her service on the SCC. Elected in 1994 to the New Mexico State Corporation Commission (SCC). She served as the SCC Chairman in 1996. Member, National Association of Latino Elected Officials.